As a child, show creator Van Orman lived in Panama City, Florida, and "used to fantasize about living near the dock and having adventures all the time." When he was 13, his family moved to Utah, but Van Orman still dreamed of adventure. He worked after school as a janitor, saving money for a plane ticket back to Florida. There, he packed some rice and potatoes, and paddled a surfboard to Shell Island. He planned to live off sea urchins and "even speared a manta ray," but things soon went sour. Eventually he became badly sunburned and began to starve. He returned to the mainland, but later tried again: he "went to Mexico and lived in the jungles and found [himself] eating out of dumpsters." Orman took his failures in stride, chalking all these bad circumstances up as "part of the adventure". Van Orman attempted to pitch the concept to Cartoon Network in 2001. He created a short and incorporated many childhood favorites, with visual inspiration from older adventure novels. His first pitch was rejected, but he received a lot of feedback and re-pitched the concept in 2003. The series works with Screen Novelties to produce the stop-motion and title card portions of the show. Paul Reubens was originally selected to be the voice of Flapjack, but when Reubens did not show up on the day of recording, Van Orman himself decided to voice Flapjack. The series came to an end on August 31, 2010 after 46 episodes. The final episode entitled "Fish Out of Water" included live action sequences and featured an appearance by creator Thurop Van Orman, and his son Leif, who played Flapjack. Flapjack - A boy who was found and raised by Bubbie, a talking whale. He is 8 years old. He is also shown sometimes with big blue eyes. 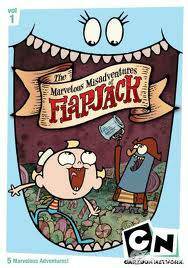 Flapjack is very naive and oblivious to danger, thus he is easily caught up in perilous situations. He holds K'nuckles in extremely high regard, with his affection for the captain sometimes bordering on obsession. His catchphrase is "Adventure!" (said whenever excited). He is caught barefoot in two episodes. He is voiced by series creator Thurop Van-Orman. In the live-action episode, Thurop's son Leif plays the role of Flapjack. Frank Welker is the voice of Flapjack in the pilot episode. Flapjack's original voice actor was meant to bePaul Reubens, but Reubens never showed up to any recording sessions. Captain K'nuckles - A washed-up and childish old sailor who claims to be the greatest adventurer the world has ever known. Nowadays, he prefers to nap and drink maple syrup, while telling outrageous tales of past adventures and getting Flapjack wrapped up in his high seas hi-jinks. In reality, his stories are either completely false, or nowhere near as adventurous or amazing as he leads Flapjack to believe. He may not be an entirely incompetent adventurer however, as he was able to steal the Mermaid Queen's heart and successfully escape her guards in "Gone Wishin'". He is a candy addict; he will do whatever it takes to get his hands on candy. Because of this, he is incredibly selfish, putting the well-being of himself and the acquisition of candy above all else. Because of his often selfish, rude, and openly villainous behavior, K'nuckles has earned the open hostility and disrespect of nearly everybody in Stormalong, but is still respected by other pirates. Although he has a habit of taking advantage of Flapjack for his own needs, he is actually fond of him and will often attempt to get him out of trouble when a scheme of theirs goes too far. He also defends Flapjack when others try to deceive him, something that he does on a regular basis. Most of his body is composed of wood: his hands are wooden, his legs are pegs and his buttocks (his "sittin' muscle", as he calls it) is a wooden board. He is also made of parts stolen by other pirates. Because of his artificial body, he makes mechanical noises when he moves. K'nuckles spends most of the adventures with Flapjack trying to find Candied Island. Flapjack often has to defend him when he is in trouble. He is voiced by Brian Doyle Murray. In the live-action episode, Thurop Van Orman plays K'nuckles. Bubbie - An anthropomorphic whale, she is Flapjack’s devoted, adoptive single mother. Bubbie serves as the primary home and transport of both Flapjack and K'nuckles. She frequently disapproves of Flapjack’s desire for adventure, but will always be won over. As told in one episode, she found Flapjack at sea in a bed of seaweed. Bubbie and K'nuckles frequently disapprove of each other's actions, especially concerning 'adventure'. She believes K'nuckles to be irresponsible, lazy, and a bad influence on Flapjack. She is voiced by Roz Ryan. Peppermint Larry - The hare-lipped owner and manager of The Candy Barrel, the only place in Stormalong where adventurers can get candy (Besides the Candy Trough, only seen in one episode.) Peppermint Larry is shown as a generally nice person, but can also be hasty and selfish at times. Peppermint Larry is lonely and unsocial, so he made a woman of candy named Candy Wife. He loves Candy Wife as if she were real, while most other residents of Stormalong "played along" to humor him; until the episode "Just One Kiss," the show was deliberately vague as to whether or not she was actually "alive" or a delusion in Larry's mind. He often buys her candy rings telling everyone she has a taste for expensive items. It is also shown he hates pickles, as when he was stranded on Pickle Island and when Candy Wife put pickle juice in his drink to strike back at Larry, who exclaims, "PICKLE JUICE?! I don't like pickle juice!" He was once fired by the Dock Hag because he was using dead rats as puppets, and after wanted to be called "Mr. Larry". He is voiced by Jeff Bennett. Doctor Barber - The current doctor and barber of Stormalong. He is not only a doctor and a barber, but also a certified candyologist, and he's a creeper. Flapjack sometimes helps Dr. Barber with his insane shenanigans, often without understanding what Dr. Barber is really up to. He is seen to live with his mother, though she resides in a dresser drawer and may simply be a voice Barber hears in his head a la Norman Bates in the film Psycho. Real or not, she seems to nag him about everything. He is obsessed with surgery, and always advises the simplest medical problems be addressed with a surgical procedure. (much to the denizens chagrin) He is often quoted to say, "Hmmm, yes." He is voiced by Steve Little. Dock Hag - The law enforcer of the Stormalong dock. She is portrayed as a semi-old woman with obvious obesity, and black hair. She is seen to have a crush on K'nuckles, making a doll of him out of his "dock tickets". She never shows this outside of her home, and is usually cold and bitter to everyone who comes in contact with her. She has a rotten nephew named Lawrence, who is almost as mean as she is (though he plays tricks on people rather than just acting mean). It was shown that when she has to fill her ticket quota, she gives them to K'nuckles. She gives tickets to him even though he isn't doing anything and makes up rules so that she can give him more tickets. She was temporarily fired in "Mayor May Not" but it was never stated that she was rehired, implying that she just enforces the rules and writes her tickets for her own amusement and enjoyment. She is voiced by Daran Norris. Eight-Armed Willy - An extremely large Giant Pacific Octopus with a cut sticking out of his head, resembling a hole. In the episode Skooled, Miss Leading dressed up like him to help Flapjack and Captain K'nuckles learn their left and rights. In the episode Willy! (Or Won't He? ), Flapjack tried to capture him with a group of people from Stormalong's only newspaper so that Flapjack could prove to a grouchy sailor that he was an adventurer and so that they can get more ink for the newspaper, but as it turned out, Willy was happy to give them ink and also helped Flapjack with his bet. Willy is shown to be larger than 100 ft. and is constantly making it difficult for Flapjack and K'nuckles to steal candy. Aside from Candy Island, Flapjack and K'nuckles attempt to get candy from Willy's secret stash of candy, located in Willy's ship. Willy has an eyepatch over his right eye, and is shown to have terrorized Stormalong for years, as he is probably the reason for the Sea Monster Alarm. He is shown to be antagonistic, but he seems to care for Flapjack. Vocal effects provided by Richard McGonagle. The Inventor - The Inventor is a man who invents stuff to force child labor and is also the dastardly brother of The Professor. He invented a whale named W.O.O.S.H, which was designed to force children to help him achieve the goal of fastest thing in the Seven Seas. He invented the camera, but it is also powered by kids (having one of the kids draw whatever he saw). He is classed as a villain because he enforces child labor and is vengeful to Flapjack and K'nuckles, but sometimes he acts as if he weren't as bad as he seems when he tried to help an overweight police officer move faster. (This, however, was really only to help him catch Flapjack and K'nuckles during their trash-diving shenanigans.) He is voiced by Jeff Bennett.